When you need to lift heavy amounts of soil, an excavator is a must on your job site. Excavators are popular earthmoving vehicles that feature a bucket, arm, rotating cab, and movable tracks. These components provide superior digging power and mobility, allowing this heavy equipment to perform a variety of functions, from digging trenches and breaking holes to lifting away waste and excavating mines. What are excavators used for? Excavators are applied to a variety of contractor and industrial needs, including mining, road construction, building construction, and demolitions. 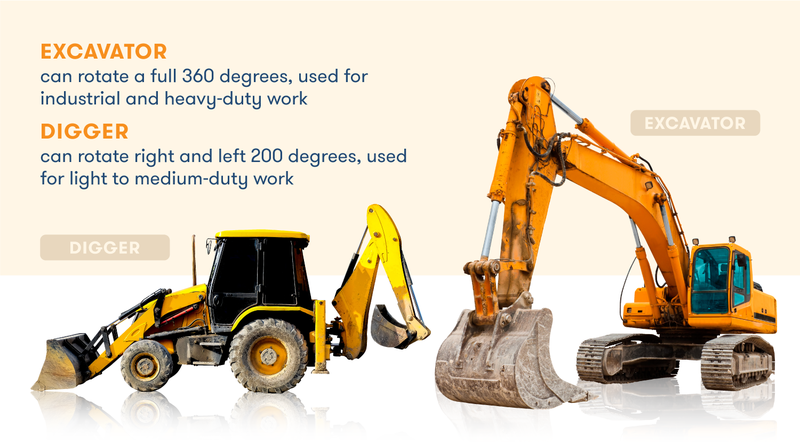 There are many types of excavators — smaller machines handle digging and drilling functions, while larger excavators have different tools for heavy-duty projects. When renting your excavator, you’ll want to consider its size and speed as well as the working conditions, such as the amount of space and the soil types. The most common excavator types are crawlers, dragline excavators, suction excavators, skid steer, and long reach excavators. We’ll go over what each type of excavator type is and what work each one is best used for. Unlike other large excavators that run on wheels, crawlers run on large two endless tracks, crawlers are often used in mining and heavy-duty construction jobs. Also known as compact excavators, these excavators use hydraulic power mechanisms to lift heavy debris and soil. Their chain wheel system allows them to slide down and scale hills with less risk, making them suitable for grading hilly areas and landscaping uneven terrain. While slower than other excavators, crawlers provide overall greater balance, flexibility, and stability. The dragline excavator is a larger excavator that operates with a different process. The equipment utilizes a hoist rope system that attaches to a bucket via a hoist coupler. The other side of the bucket is affixed to a dragline that runs from the bucket to the cab. The hoist rope raises and lowers the bucket, while the dragline pulls the bucket toward the driver. Due to their weight, draglines are often assembled on site. The unique system of this type of excavator is commonly used in large scale civil engineering projects like canal dreading. Also known as vacuum excavators, these excavators feature a suction pipe capable of letting air providing up to 400 horsepower. The excavator first releases a water jet to loosen the ground. The pipe, which contains sharp teeth at the edge, then creates a vacuum that carries away soil and debris up to 200 miles per hour. A suction excavator is ideal for delicate underground applications, as it can reduce the chance of damage by more than 50 percent. Unlike standard excavators, skid steers have booms and buckets that face away from a driver. This orientation allows the attachments to reach over the cab instead of around it, making them useful in more narrow areas and maneuvering tricky turns. They are often used for digging pools, site cleaning, residential work, and debris removal, where space is more limited and objects are spread out apart. As its name suggests, a long reach excavator features a lengthier arm and boom sections. The design allows for better operation in hard-to-reach locations. The excavator’s extendable arm can reach over 100 feet horizontally. These excavators are best used for demolition projects like structural crumpling and breaking down walls and applications that are over a body of water. Different attachments can be affixed to the arm to perform additional jobs such as shearing, crushing, and cutting. An excavator’s design allows the construction equipment to be used for many versatile purposes. Hydraulic cylinders, booms, arms, and attachments provide digging and holding functionalities, while a house-like cab provides the driver with controls to direct the excavator. A rotating platform and wheels provide the necessary mobility to lift and remove debris from the work site. Excavators use a variety of hydraulic attachments that serve different purposes. In addition to a bucket, other common attachments include an auger, breaker, grapple, auger, lamp, and quick coupler. Buckets are the most common attachments seen on excavators. These steel attachments have teeth-like edges that can provide digging and scooping capabilities. Buckets come in different varieties. The most common are ditching buckets — which is designed for grading stones — and trenching buckets, which are used to dig trenches. Attaching an auger allows you to bore into the ground. Powered by hydraulic circuits, these helical attachment have the ability to reach over objects and drill deep holes. Augers come in different specifications and sizes for various digging conditions and terrains — they range from 4 inches to 50 inches in length and can dig up to 32 feet. Breakers are similar to jackhammers but are much larger in size. With the ability to provide up to 1000 pounds of impact energy, these attachments are used to break into tougher surfaces like stone and concrete. Clamps allow excavator operators to pick up large materials such as tree stumps and concrete that are too oversized for a bucket. The attachments can be used with buckets or as pieces in a grapple. Clamps are easy to attach and detach from excavators. Couplers allow you to quickly switch between tools and attachments without a crew. This is handy when you are moving between different tasks and processes on a job site. Backhoes, also known as diggers, are a common fixture on construction sites but are often confused with excavators. While they share similar digging and lifting capabilities, the two equipment differ in size, weight, and functionality. Excavators are generally large equipment weighing up to 200,000 pounds. Their bucket and boom design allow them to rotate a full 360 degrees. A backhoe, on the other hand, is generally much smaller and shares more similarities in appearance with a tractor. The design means a backhoe can only rotate 200 degrees side to side. Its front and back buckets design can excavate materials, load waste, and drag debris toward the vehicle. Renting a backhoe is best for light or medium duty jobs with versatile applications. In recent years, more contractors are using a mini excavator, a smaller and lighter pint-sized version of the standard excavator capable of minimizing ground damage and fitting through crowded, narrow sites like parking lots and indoor spaces. Also known as compact excavators, mini excavators typically incorporate reduced tail-swing or zero-tail-swing to provide tighter turns and avoid contact with any obstacles. 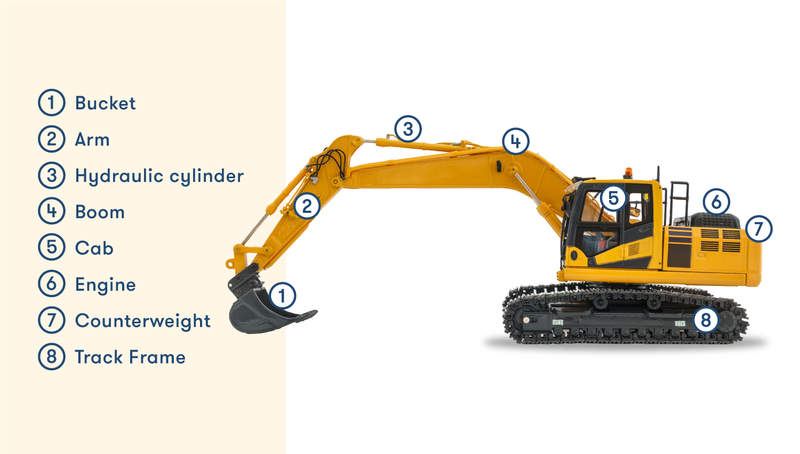 While there are many different types of excavators, their core functionalities are similar. The lifting and digging abilities make them a staple on just about any construction site. Their high cost makes renting them the most cost-effective way for the majority of companies.